La Salle, Texas, Jackson County. J.M. Bennett with Ike and Sol West founded a Hereford and Brahman cattle ranch here in the mid 1870s. 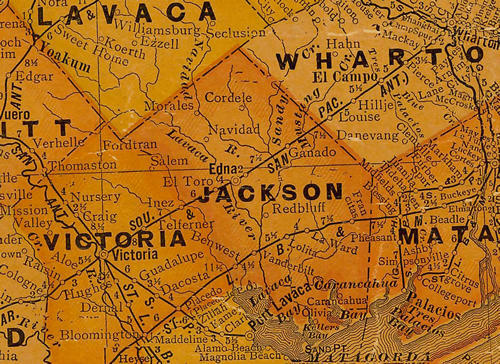 The Livestock was shipped from Inez, Texas until the railroad reached the Bennett/ West holdings. The new station had been originally named Benwest, but when the West Brothers bowed out of the business in 1922, the station was renamed Bennview. Poles and Czechs were lured into investing in the planed town in the mid 1920s when Bennett sold off land to settlers. A post office named Bennview was open from 1928-1930. The name was changed to La Salle in the late 30s and by 1941 the population was 60. Thirty years later it was still just 103. In 1988 residents numbered just 75 and the state map shows an estimate of 67 in 2007.